Sanath Jayasuriya is a former Sri Lankan cricketer who is not only regarded as one of the finest attacking batsman of Sri Lanka but also the world's. A very fine looking left hand batsman, he is also handy with his left-arm spin bowling mainly in shorter form of cricket where in ODIs (One Day Internationals) he has scalped more than 300 wickets. He was born in Matara, Ceylon (Sri Lanka) on 30 June, 1969. Capable of destroying any decent bowling attack on his day, he has sat his own style of playing the game, whether it is in batting or in bowling. He is also been an outstanding and effortive fielder for the team throughout his career. Sanath Jaysuriya started his cricketing career in 1988/89 in domestic cricket and soon he got his first break in International cricket in an ODI match against Australia in 1989 at Melbourne in Benson & Hedges World Series, a tri-nation tournament. He didn't contribute much with his batting and didn't got chance to bowl. Two year later he makes his Test debut against New Zealand at Hamilton. He made 35 runs in the only inning of his in that match. He didn't do well in his early Test Career. But remained one of the better plaer in ODIs. In 1994, he scored his first ODI century against New Zealand team while opening the batting for Sri Lanka and established himself as a regular opener for the Sri Lankan ODI Team alongwith Romesh Kaluwitharana. He made a fine 140 runs off just 143 balls in that inning. But his first Man of the Match award in ODIs came due to his 6 wickets in a match against England. His best time came in 1996, when he become more regular got place in the Test side due to his first hundred in Tests. This came against strong Australian team and he scored 112 runs. The same year in the 1996 Cricket world Cup, he become a hero in Sri Lanka as he was the Player of the Tournament while scoring 221 runs and 7 wickets. His attacking batting in first 15 overs started a new concept in ODI cricket history. He over stepped and launched his shots over the heads of the fielders in those 15 overs. This strategy works so much that the Sri Lankan team become the Winner of the World Cup 1996. Even after the World Cup he continued his great form and made the fastest century and fastest fiity in ODIs. He scored century in just 48 balls. Later this record was broken by Shahid Aridi. But his fifty in 17 balls is still a record in ODI cricket alongwith Shahid Afridi. In 1997 when India toured Sri Lanka, nobody had thought about that great test at Colombo in which some very great records were established during the match. He scored 340 runs in the Sri Lankan first innings which reached to a record score of 900 plus. 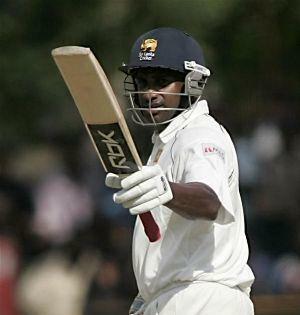 Jayasuriya was also involved in a partenership of 576 runs for the second wicket with Roshan Mahanama. This was the highest partenership in Test cricket for any wicket. His score of 340 was also highest by any Sri Lankan in Test cricket. Later both these record were broken. In 1999, Jayasuriya become the captain of the Sri Lankan Cricket Team. In 2000 in a final at Sharjah against India he scored his highes ODI score of 189. After 2003 World Cup, he resigned as a captain of the Team. In 2005, he played his 100th Test and this made him the first Sri Lankan to do that. The following year he declared his retirement from Test cricket due to his ordinary performances in longer format of the game. But he continued to play in the shorter form of cricket. He came back in the Test cricket an in 2007 he played hi last Test against England at Kandy. At that time he was just 27 runs short from 7000 runs landmark in Test cricket. The 2006-07 was a great for him in ODIs as he played some very big hundreds in that period. Even at the age of 39, he was the same attacking batsman as he was used to be. In 2007 IPL, he was the member of Mumbai Indians Team. He performed excellent in that inaugural IPL season, but failed to repeat that in the later seasons. Jaysuriya was also a very good left-arm spin bowler. Without doubt he can be considered as an excellent all-rounder in the history of ODI cricket. With over 13,000 runs he has also more than 300 wickets in ODIs. Even some great bowlers of his time couldn't able to reach that feat. He also had 98 wickets in Test Cricket.